If you have wee ones you will definitely want to get a Preschool Pass. The Preschool Pass is a FREEannual pass for kids 5 and under, good for both Busch Gardens Williamsburg and Water Country USA. The best way to save money if you plan on visiting the park more than once is to get an Annual Pass or a Flex Pass. Flex Passes are great, for just $10 more than the price of a Busch Gardens Single-Day ticket, enjoy unlimited admission to Busch Gardens and Water Country USA for up to seven consecutive calendar days from the date of first use. The pass can be used any time May 19-Sept. 10. Another great program is Waves of Honor; a FREEsingle day admission for active duty member and up to 3 dependents. Check out the local libraries in Williamsburg- The library has had coupons in the past around April – May time frame which are good for 25% off a single day pass. A few places to check in advanced: Parks and Recreation or if you are military, getting passes on base is super cheap! If you go on a weekend try going on a Sunday earlier in the morning. Arrive 15-30 minutes before the park opens. The gates open early so you can get through the bag check and check-in and are ready for attractions when they open. One of my favorite features about Busch Gardens are all the family rides that everyone can go on together. No matter your height or age you can on all three of these rides: Aeronaut Skyride, Rhine River Cruise and Busch Gardens Railway. Aeronaut Skyride allows you to see beautiful Busch Gardens through a birds-eye view. This is a fun ride and also can work as transportation around the park so you don’t get tired from lots of walking. Rhine River Cruise is an actual river cruise on a boat where you can enjoy the remarkable landscape and other wonderful sites on a relaxing and scenic cruise that showcases the beauty of the Busch Gardens. Busch Gardens Railway offers a great tour of the park on a stunningly scenic twenty-minute train ride. This ride is my boy’s favorite ride in the whole park because they are obsessed with trains and the park uses real working steam locomotives. There are three engines Red, Blue and Green. My son gets most excited when the green engine is in operation because it has a caboose! There are three stops throughout the park, so you can use this as a fun ride or for easy transportation around the park. Catch a show! The shows are entertaining and also a great way to cool off since the in door theaters have air conditioning! One of the first things you need to do as you enter the park is check how tall your little one is. Right as you enter the park in England look for the red phone booths on the right after Guest Services. A park attendant will measure your child and given them a color coded wristband along with a list of rides they can go on. This will help you plan out which rides are suited for them. My boys who are ages two and four love Sesame Street Forest of Fun. My oldest is tall enough to ride his favorite ride in the Forest of Fun called Grover’s Alpine Express (a kiddie-sized roller coaster.) We always ride Grover’s Alpine Express together; it’s so much fun to see him put his hands in the air and scream as we wipe around bends sore over hills. My youngest son’s favorite Sesame ride is Prince Elmo’s Spire; a mini drop tower ride that gives you the best wooly loops! My boys also love the rubber padded play ground; they run around and get a lot of energy out. There are other great rides in this section and even a sing and dance along show that runs throughout the day called Sunny Celebrations. The best part about Sesame Street Forest of Fun and is that there is a splash pad with lots of water features, making this ideal for hot days! I also want to point out that there is a comfortable nursing station right next to the bathrooms. If you forget an essential like diapers, wipes, swim diaper or sun screen you can get those necessities in the gift shop. Don’t forget about Germany, where you will find the Carousel, The Red Baron and The Land of the Dragons!!! The land of the Dragons is a really awesome giant tree house which they can climb and slide down slides. There is even a small splash pad. This activity is great for toddlers and young kids, parents are able to accompany their little’s easy through the tree house. There are also a bunch of rides to go in Land of the Dragon. Located towards the entrance of to the left is where you will find the family bathroom, first aid station and nursing room. Italy is another idea spot for little ones! Both my two year old and four year old enjoy riding on the Hot Air Balloon and Glider together. There are so many great rides for the older kids too. Some of my favorites are in Italy; Escape from Pompeii and Roman Rapids. In Ireland, you won’t want to miss Europe in the Air which is a 4-D show ride. In Germany my husband’s all time favorite ride is the Bumper Cars. Don’t forget about the six roller coasters spread out through the whole park. Kids concerts are back! Start spring on a high note with kid-friendly concert series that encourage kids to sing and dance along. The schedule includes Choo Choo Sole with Genieve May 6th, Kidz Bop Kids May 13th, Teen Stars Live May 20-21. Two new shows are set to debut this season. Don’t miss Britmania a new musical revue featuring British hits from the 1960s to today, debuts June 30, and will be performed throughout the day in the Globe Theatre. OktoberZest will feature German music and dances with a modern and new approach. It will debut March 31 in Das Festhaus in the Oktoberfest village. Kid Friendly Halloween Event Celebrate is new this Fall which will feature a silly, not-too-spooky fun at The Count’s Halloween Spooktacular on Saturdays and Sundays from October 7 – 29. Children can come dressed up to join in the costume parade and participate in other family-friendly activities during this daytime event. My biggest suggestion to get a souvenir cup. We bought two souvenir cups and are so glad we did. You purchase the cup, the day you buy it you get to fill it up for FREE!!! Than everytime you return it only costs 99 cent to refill it anywhere throughout the park! You are also welcome to have it filled with ice or water for FREE. Also if you are looking for a cold treat, for $1.99 you can use your souvenir cup to fill it with a Slurppe. The Slurpee station is found in Sesame Street Forest of Fun. One way to save money is to get a meal deal pass online before you go. Our two favorite places to eat are Trappers Smokehouse in New France and Das Fest Haus in Germany. The Fest Haus is great because it temperature controlled, has lots of food options and puts on a great show to watch while you eat. At Trappers Smokehouse you can smell the food cooking on the grill from miles away. The aroma of BBQ is mouth watering and the rotisserie chicken and BBQ ribs are heavenly. One thing I have learned is that portions are huge at the park. There is no need for everyone to get their own..So share! Getting a “personal” pizza and a fruit cup is enough for 2-3 people. Don’t forget that if you have a annual pass member card you receive discounts on purchases throughout the park including food! If you don’t have room in the trunk for a stroller or even forgot to bring one. Use the park strollers! They are spacious and can fit two kids! They even have a cup holders and area for storage. They are available to rent at the main gate. Don’t worry about bringing a cell phone charger. If your battery drains head over to the Brauhaus Craft Bier Room. There are a lot of attractions where you get wet. I suggest bringing a towel, wearing a swim suit under your clothing or even brining an extra change of clothes. Also, be sure to bring a ziplock bag to keep wet clothing in. Don’t forget sunscreen. Even though there are a lot of shaded areas. The summer sun can be quite harsh in the summer. Don’t fear parking far away from the entrance, riding on the tram is half the fun! Take a picture of where you parked with your cell phone in case you forget. Also take a picture of your family before entering the park kept smiles while everyone is excited and to remember what your little one is wearing for if you get separated. Consider writing your name and cell phone number in the tag of your little ones shirts, should they get lost. If you need a quiet place to nurse or nap the baby don’t forget about the lovely nursing station and First Aid house located in Land of the Dragon. The picture below to the right is of the play area available for siblings waiting while mommy feeds the baby. Look for a family bathroom? There are few through out the park. My favorite is in New France; it is spacious and kept well maintained. See picture below and to the left. I hope that these tips help with your planning so that you have a great time during your next Busch Gardens Williamsburg Visit!!! Thank you for reading…Play, Learn, Grow! This sounds like a really fun getaway with a little bit of everything to keep the whole family having a blast. There’s not a Busch Gardens park near where my family lives, but I still have memories of going there as a kid. I have good childhood memories at BG too! Thanks for checking out the article. This place looks awesome! If we’re ever near it, we’ll check it out. My husband is military so we’d use the Waves of Honor deal! There aren’t too many that the four year old can do that the two year old can’t. In Sesame theres only one ride he can’t, Grovers roller coaster. I will take little man on the coaster while daddy takes the little one on something else. Than all the rides like by air balloon and stuff in Dragon land everyone could do. The family rides and shows are good for all. We also use the rides he can’t go on to share about eating healthy and growing lol. Because they are so close in age and height that issue has been few and far between. This looks like it could make a fun day for the family. I’m glad you had a fun trip. Looks like a great theme park and there seems to be loads for little ones. I can’t wait for my children to be old enough to enjoy a theme park. wow!This seems like a really fun place for kids.I am sure my kid will love this place.The train must be one of the popular attractions among the kids..
Haven’t been there in a decade – it’s such a fab place I would love to go back! This is a fantastic one-stop guide to the Gardens! I’m definitely bookmarking it! My daughter would love the Sesame Street Fun Park! This place sounds like such a great place for families. I loved visiting Busch Gardens as an adult, so it’s good to hear that there is plenty for kids to do! Glad you all had a good time! I’ve never been here before but I can see why it’s a huge hit with the kids! There are just so many things to do here! It’s really awesome to go here with the whole family! It’s tough not to have a great time especially when you see the kids enjoying all the attractions. looks like everyone had a great time. i’ll have to keep this in mind when visiting. This looks like such a fun place to visit with kids. I will have to check out the one that is close to us. Thanks for sharing a great place to visit. We love to go to Busch Gardens. We always have a great time. Great park, its an awesome local park during the summers in Hampton Roads. Thanks for bringing back the memories. Details: Join Moms Club of Waldorf West for a story and craft time! We are going to read about spring and make a windsock! All ages are welcome! Details: Come celebrate one of math’s biggest celebrities…Pi! Learn what Pi is and why it’s important, and celebrate with a slice of pie! Details: Join us for a special storytime with our favorite Mo Willems characters. We’ll read Mo Willems’ books and have lots of fun with Pigeon, Gerald, Piggy, and more! Details: Come out for Tween Movie night! We will be watching Despicable Me 3. Details: Register for the following homeschool days that include educational programming and lunch. Details: Join us for our monthly get together the 2nd Wednesday of each month September through May. We will have a story and a craft. We will also talk about what’s coming up in the club. Feel free to bring a snack to share but it isn’t required. Details: This March 14th, celebrate Pi Day! This day is designated as Pi Day because the date in its numeric form 3-14 represents the first three digits of Pi. And what better way to acknowledge a day dedicated to this unique mathematical constant. The Playful Parent is hosting this event to explore activities created by the STEM Squad team from NumbersAlive! Join us for a fun event that will focus on Science, Technology, Engineering, Art and Math. There will also be pie. Details: Pi Day is celebrated on March 14th (3/14) around the world. Learn about Pi through a fun, mathematically, delicious activity. Come and get Pi! Ages 8 and up. Registration required as supplies and space is limited. Details: Join us for a craft program where we will create ladybugs and bees out of paper plates and construction paper to celebrate spring. Details: Join us for an afternoon of art history and a hands-on art project. Attendees will learn about a different artist each month and what made why their art is so unique and then get to create to make your own one of a kind art inspirations. The Calvert Marine Museum is proud to announce the addition of a new free program for girls interested in learning more about sharks. Gills Club is a STEM-focused program from the Atlantic White Shark Conservancy (AWSC) with activities designed for girls ages 7 – 12. Meetings will be held from 5:30 p.m. – 7 p.m. in the Harms Gallery. Preregistration is required. See link to register. AWSC is raising awareness about white sharks as a keystone species of the ocean ecosystem. It was established to support white shark research and education programs to ensure that this important species thrives. Meeting will be held on Thursdays, December 21, 2017; January 25, 2018; February 22, 2018; March 15, 2018, and April 26, 2018. For more information, email Mindy.Quinn@calvertcountymd.gov. Details: Charles County Public Schools (CCPS) is hosting its annual HITS Expo at St. Charles High School. The Expo is free and open to the public from 1 to 5 p.m. and includes exhibits, hands-on activities, robotics demonstrations and more. The Expo also includes the annual judging of history and science fair projects. The awards ceremony begins at 5:30 p.m. A flyer with more details is included below. Mark your calendars! Details: If you and your friends are crazy about Minecraft, join us for an evening of building and Creepers! We’ll provide the building challenges (past challenges have included building a library and building statues) and you provide the creativity! Details: Make sure your daughter is dressed in her best dress for dancing. Every girl receives her very own tiara and souvenir photo. An evening of dancing, crafts, games, light refreshments, and photo opportunities will make a perfect father daughter bonding time. 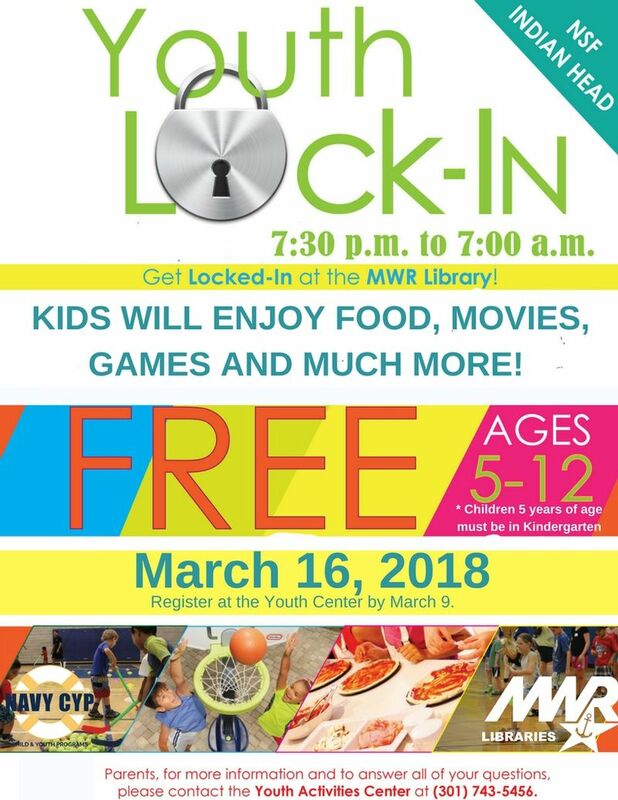 Details: Kids will enjoy food, games, movies, and much more at the library. 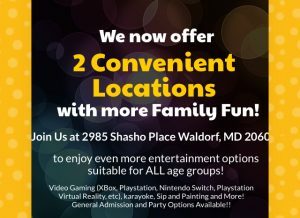 Registration: Call to register at the Youth Center, 301-743–5456. Details: Volunteer and help Sotterley help others. Many of you know we deliberately plant our crops for giving back to those in need in our own backyard. This year — on St. Patrick’s Day — Sotterley is calling for a community day of planting potatoes to donate to our local food pantries. This is a family-friendly event, children 5 and older can help plant potatoes. Join the Sotterley staff as we get down in the dirt. Dress appropriately for this weather-dependent* event. Watch our website and Facebook for updates. Please remember some gloves. Shoes may get muddy if plots have recently had rain. *Raindate – March 24! Details: Multi-vendors shopping event. Come on out and support your local small vendors on St. Patrick’s Day! Lots of Special Sale! Details: Best Float, Most Spirit, Best Dressed & Erin Go Braugh are just some of the prizes awarded to talented marchers at the Chesapeake City St. Patrick’s Day Parade. The parade kicks off at noon on March 17. The Mummer’s Duffy String Jam Band entertains from Pell Gardens right after the parade. Plus, local pubs are signed up for the Pub Crawl following the festivities. Details: My husband works in VA and we often enjoy traveling down to Fredericksburg. All the events in Spotsylvania County are a lot of fun and family friendly. The 16th Annual Jeff Fitzpatrick St. Patrick’s Day Parade starts off at NOON, includes fire trucks, classic cars, high school marching band, community organizations, Irish dancers, horses, military equipment and local pageant winners. The parade ends at A. Smith Bowman Distillery, where we will be hosting a St. Patrick’s Day Festival including local vendors, live music and entertainment, family-friendly activities, food from local food trucks, and of course, plenty of beer. We will be collecting food for the Fredericksburg Regional Food Bank. Event is sponsored by Adventure Brewing Company. Details: Come out for a day of fun in honor of The Lekemia & Lymphoma Society. Lets go fly a kite! There will be lots of great activities for kids including; kite flying, face painting, balloon animals and the first 500 participants get a free kite! Details: Greenwell’s program provides the chance to: learn new skills that foster nature connection, gain a sense of empowerment and independence, and feel a sense of belonging by bonding during activities & fireside meals. Every weekend we will do team building activities, awareness games and challenges, cooking around a fire together, evening stories and chats, and outdoor sleeping. We will also do seasonal activities and different evening activities each month! Participants who are signed up for multiple weekends in a row will get to help plan future weekends based on interests and passions. Details: Purchase the clay pot, and Micahaels will supply the supplies to decorate it for FREE! Details: There’s slime everywhere! Join us to make different slime recipes and see which is your favorite.